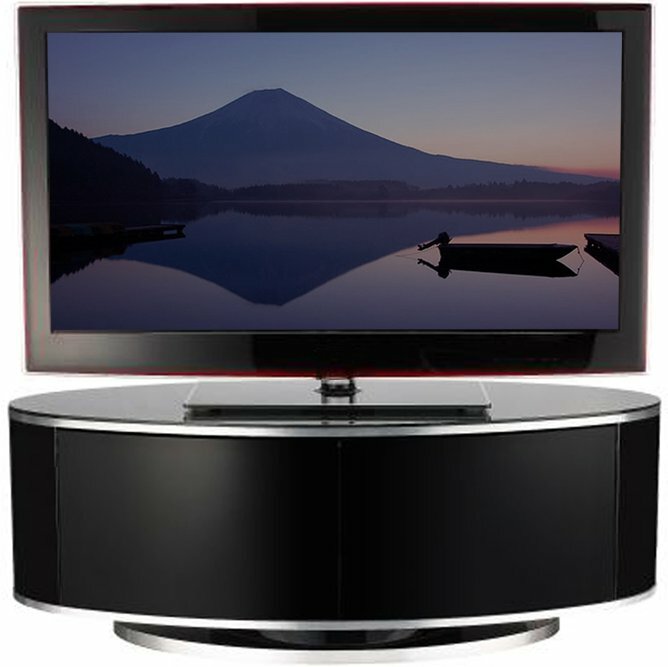 A modern television set needs a modern display unit to sit on... And they don't get more modern than the Luna TV display unit. Suitable for a flatscreen television up to 50 inch, the high-gloss piano black finish is made even more stunning by the brushed aluminum edging. A cabinet provides a smart place to keep your satellite box, games console or DVD player, while unique "BEAMTHRU" technology allows you to operate your AV equipment without opening the doors. 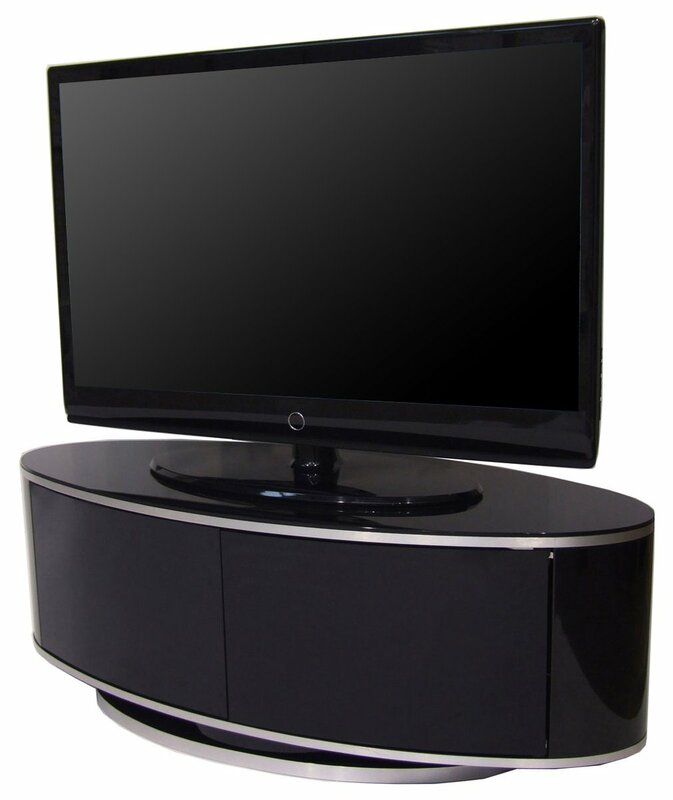 Finally, the clever swivel base can be rotated 60 degrees, so it's easy to get the perfect viewing angle. It took two of us to put the cabinet together as the instruction pictures were very basic and it was a case of "two heads are better than one". We spent over three hours. When the Engineers came to set up our TV, they said it has always taken the two of them at least two hour even though they have set up quite a few of this model cabinet! Bit difficult to fit rear panel. Worth the effort though. No this is an excellent stand. It needs two people to assemble it but isn't difficult to do. Hi there it says this is hard to set up ? Is this true? I have just ordered this stand for a 55inch tv and sound bar. 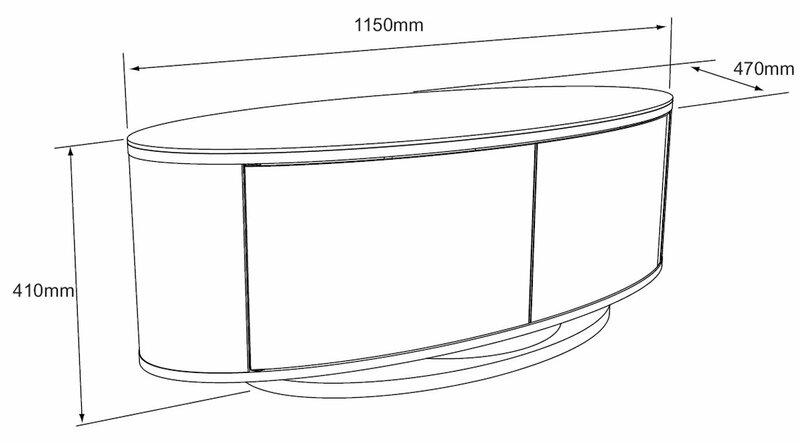 My concern is whether the soundbar will overhang as it is 100cm wide and I cannot visualize how oval the stand is. Can anyone advise? the stand is 110cm wide at its widest part of the oval.i have also fitted casters to the unit to make it easy to clean the floor.hope this helps. Please can you put a Sony sound bar HT-SF200 measuring 58cm wide x 10 cm deep x 7cm high inside the unit and still have space for sky box, BT box and DVD player. Thanks. Hi. We are looking at storing DVDS in the sections on each side. Would you be able to see these behind the closed doors? Many thanks in advance. Can a curved tv be used on this cabinet? Yes it can. I have a 49" Samsung curved on it with a Sony sound bar on the front. The cabinet backplate is a bit tricky to put together. Once done perfect. Go and buy it you not be disappointed. It would fit but would overhang on the sides. According to MDA. Designs Luna is up to 55"